When you love waking up before dawn and watching the sunrise while you check on plants, you know you’re a farmer! 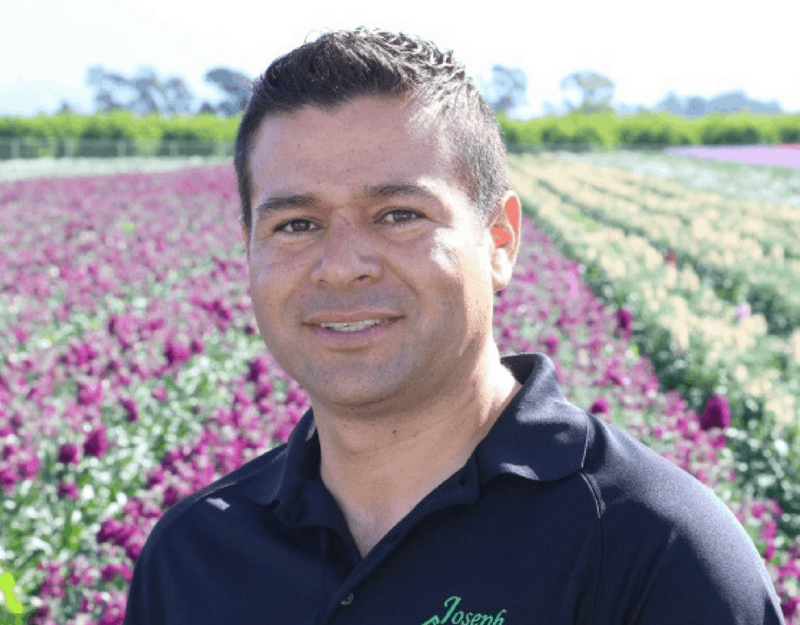 As the Santa Paula Grower for Joseph and Sons, Rafael Ortiz gets to do that almost every day. Meet the farmer behind some of the beautiful blooms you see in stores! Rafael: My main job is overseeing the production of the flowers; from planting to harvest. I am in charge of selecting the varieties that we are going to grow based on the seasons. Also, I review the nutrition program and overall health of the flowers. CA GROWN: What is your favorite part of farming? Rafael: One of my favorite activities is checking the plants every morning at dawn. I like to check the fields watching the sunrise; it is a very relaxing experience. CA GROWN: How do you give back to the community? Rafael: We donate flowers to the church for their events. Rafael: I think I have it in my blood. I grew up in a ranch environment since most of my family had been dedicated to the field. I remember my childhood; I liked to accompany my dad to the ranch on weekends and in my teens. I liked to go to work during the holidays. Thanks to the support of my parents I managed to graduate as an agronomic engineer. CA GROWN: What are your hobbies or past times when you are not farming? Rafael: I like to spend time with my family. I have a wife and two boys. I like to go the gym and on hikes with my family, my main hobbies are sports. My children practice martial arts. CA GROWN: What advice would you give to someone who wants to start farming? Rafael: To prepare yourself – do everything possible to learn from the bottom from removing weeds to the use of agricultural technology. CA GROWN: What are one or two things you do on the farm to be sustainable? Rafael: We are doing our best to reduce our consumption of water by using drip tape. Also, we’ve updated our tractors with GPS systems to save diesel and help reduce pollution.